Invest in your heart and health! It’s almost hard to describe just how truly valuable this supplement is for your body! Beachbody's select Core Omega-3 gives you the absolutely critical nutrients it needs for a healthy heart, brain, and joints. * Let's be honest--it’s hard to get the right amount of healthy fish in your diet, bu this high-quality omega-3 fish oil supplement contains 600 mg of EPA (eicosapentaenoic acid) and 400 mg of DHA (docosahexaenoic acid) per serving—that’s a daily dose similar to getting the health benefits of an average serving of salmon steak! Many studies have shown that consuming omega-3 fatty acids—especially DHA and EPA—may help reduce the risk of heart-related diseases. * In today’s high-stress/fast food world, that’s a very big deal! In fact, the American Heart Association recommends getting at least two servings of fatty fish a week to support cardiovascular health. Be careful: not all fish oils are created equal. 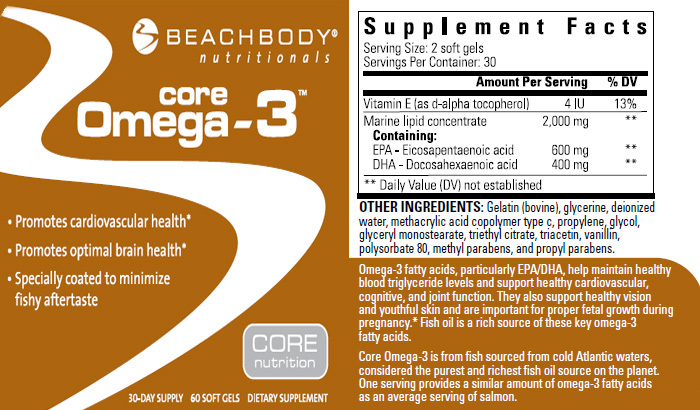 Beachbody's Core Omega-3 comes from the purest wild Atlantic coldwater fish sources, and is absolutely guaranteed to be free of harmful PCBs and heavy metal contaminants typically found in fish available in markets and grocery stores.